Hurricane Harvey hit the Gulf Coast of the United States on Aug. 25, 2017 as a Catergory 4 storm with sustained winds of 130 mph. It has and continues to threaten millions of people with multiple days of heavy rain, winds and rising tides. This slow moving storm could bring up to 50 inches of rain to Texas in the days ahead. While many have evacuated, significant damage is still expected, and thousands of people may be housed in shelters for an extended period of time. The Board of World Mission has been following the response of our ecumenical partners, and have been in direct contact with representatives of the Unity of the Brethren Church in Texas, which has several congregations in the Houston area. Moravians have a shared heritage with this denomination going all the way back to Jan Hus, and they have a representative who attends BWM meetings. 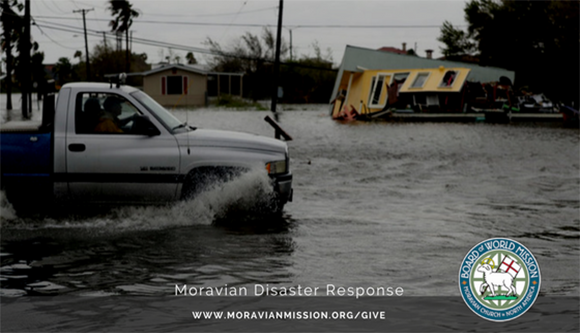 The efforts of Moravian Disaster Response (MDR) will be in coordination with the Unity of the Brethren. They have asked for time to assess immediate and long term needs. If you are feeling called to help respond, please see avenues for donating and volunteering below. It is our hope to have donations ready to go and sent quickly once a plan of action has been put into place.